Located on the site of Bali’s first five-star Hotel Bali Beach, founded in 1966 – is the most complete resort complex in Bali, featuring state-of-the-art visitor facilities, but also numerious artistic amenities that bring to life the cultural excellence of the Balinese people and their many talented neighbors. Sanur, Bali’s original seaside, has long been known for its world class facilities and atmosphere of comfort and privacy. This oasis of luxury offers a wide range of dining and leisure opportunities. 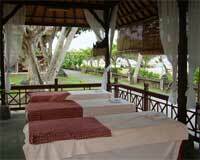 The Spa is set within the landscaped grounds of Sanur´s first five-star hotel, the renowned Grand Bali Beach. Established in 1966 and marking a new era in tourism for Bali, this historical landmark hotel complex covers 45-hectares with over 500 guest rooms, a selection of restaurants and a 9-hole golf course. Enclosed in a charming Balinese garden bursting with tropical flora and decorative ponds, the Spa overlooks the main swimming pool and is just meters away from Sanurs white sandy beachfront. The gentle sounds of waves lapping upon the shore line can be heard from the spa facility and creates a peaceful backdrop for treatments. The Spa lobby is a stunning piece of architecture and features a high circular ceiling diorama depicting painted scenes of daily Balinese life. A total of 12 individual treatment rooms are tastefully appointed and are appropriately named after species of local flowers. A rustic pathway winds its way through the garden linking all structures, which includes treatment rooms, two separate sauna/ Jacuzzi facilities and a relaxing Balinese gazebo to enjoy refreshments. See all treatments at the treatment tab above. Jamu Spa - USD 50 - 120 min. It consist of herbs and spices that we wrapped tightly in muslin or cotton and then push in hot water or steam, may be placed on various part of the body to relief shore muscles, stimulate cieculation and refresh the skin. 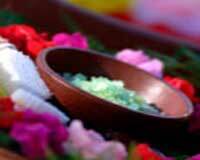 It includes aroma therapy footbath, traditional massage, Jamu spa, flowerbath and spa drink. Our Treatments --Select-- Aromatherapy Massage (1 Hrs, 15 Min) - US$ 35Stone Massage (1 Hrs, 30 Min) - US$ 35Shidora or Ayurvedic Massage (1 Hrs, 30 Min) - US$ 35Traditional Massage (1 Hour) - US$ 28Relaxing Massage (1 Hour) - US$ 28Avocado Body Scrub (30 Minutes) - US$ 20Honey Seed Rub (30 Minutes) - US$ 20Balinese Boreh Scrub (30 Minutes) - US$ 20Balinese Refreshing Facial (1 Hour) - US$ 30Jamu Spa - USD 50 - 120 min.